You can cook this dish just as easily for a big group (as long as you have enough ramekins) as you can for one person. At 15 minutes, it’s perhaps the slowest way to cook an egg, but it’s effortless. Instead of the prosciutto and tomato, you could put chopped cooked spinach or cooked asparagus in bottom of the cup, with a little cream. Or place the egg on a bed of chopped ham, bacon or sausage. Sprinkle with Parmesan if you like. 1. Heat oven to 375 degrees. Smear a bit of butter or oil in ramekin; line with tomato and prosciutto. 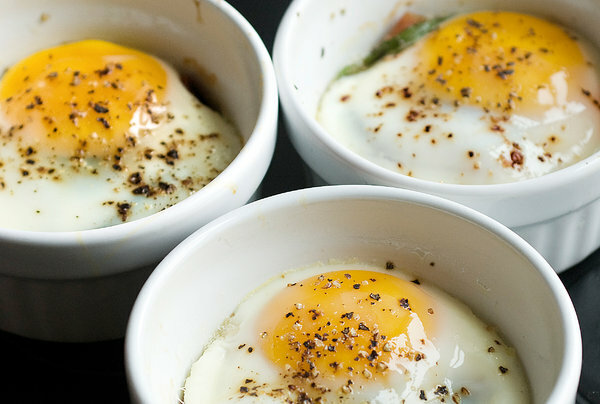 Break egg into ramekin, then put on a baking sheet. 2. Bake 10 to 15 minutes, or until egg is set and white has solidified. Because the cup retains heat, egg will continue to cook after you remove it from the oven, so it is best to undercook it slightly. Precise time, in a good oven on a middle rack, is 12 minutes. Sprinkle with salt and pepper and serve.